Channels and Patterns: Four More Years? Looking at the polls this morning an Obama victory looks more likely than not. I don't have much time for Obama, as in my view he's just been a stuffed shirt and empty head sitting behind a desk that a president of genuine force and vision, like either Hillary Clinton or John McCain, could have been occupying to much greater effect. All one can say for him really is that he looks good compared to his predecessor, who was really an unmitigated economic and fiscal disaster. That said Obama is on the verge of his first genuinely impressive achievement in office, which is being re-elected with a track record that would have sunk most re-election campaigns. If he is re-elected tomorrow this may of course also be his last impressive achievement in office. What would an Obama victory mean for the markets? Well it will leave Ben Bernanke still firmly in the saddle centrally planning/directing the US economy, and as Ben Bernanke has so far been a one-trick pony in terms of policy, that means that we can look forward to four more years of money printing and ZIRP in an effort to bring back the gold old days of the Fed-led speculative bubbles in 1995-2000 and 2003-7. 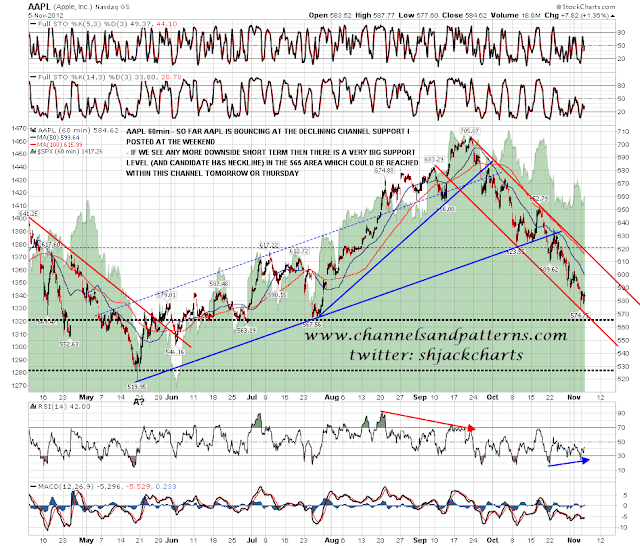 That has been good for equity markets in the past and may well still be good for a while yet. There is a serious question mark though over current policies of massive deficit spending. Even if the fiscal cliff is delayed well into 2013 it's hard to see an agreement to continue running huge deficits indefinitely emerging unless the Democrats win big in both houses of Congress. If the republicans have an effective veto over this then some significant government retrenchment seems likely. 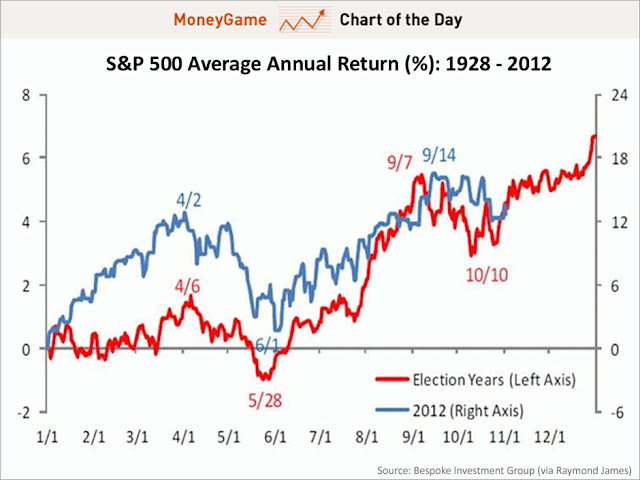 That will be a big economic wild card in 2013/4 whoever wins this election. Short term the important resistance levels on ES are at 1416.5 and 1432 and I'm leaning towards another test of 1432. Support on ES is now at 1410 and the last low at 1402.5. A break below 1402.5 would establish short term lower lows and highs and would open up a test of the current retracement low on ES at 1393, and the very strong support level just below at 1388.